Gary was born February 25, 1946 to World War II Veteran, James J. Weber, and Bette Weber. He attended Elder High School, graduating during June 1964, and went on to study Mechanical Drawing at the Ohio College of Applied Science until 1966. On September 15, 1966 Gary enlisted in the United States Air Force during the Vietnam War. He came out of Basic Training as an Airman (E-2), went to Tech School for 3 months, served as a Crew Chief for 3 months, and then shipped overseas for almost 4 years. He was honorably discharged as a Staff Sergeant (E-5) on September 9, 1970. Gary joined the Cincinnati Police Division on September 8, 1974. He was promoted to Police Officer on February 2, 1975 and assigned to District 7 (813 Beecher Street). One year later, as was the custom then, Officer Weber was rotated to District 3 (3201 Warsaw Avenue). On December 6, 1976 he and 123 other officers were laid off due to a City budget crisis. Officer Weber was hired by the Cincinnati Correctional Institute (formerly Cincinnati Workhouse) on Colerain Avenue as a Corrections Officer. He was recalled to the Police Division September 18, 1977 and reassigned to District 3. By September 1982, Officer Weber had served his country and community for 12 years with 13 letters of appreciation and/or commendation. September 8, 1982 was Officer Weber’s eight Anniversary in Cincinnati law enforcement. Police Officer Charles Klug (40) also graduated from Elder High School, 5 years before Officer Weber, and had been on the Police Division 5 years longer. He had served in District 2 (314 Broadway) and then District 1 (310 Lincoln Park Drive) when the two districts combined. He transferred to District 3 during 1980. He was a highly regarded officer and a member of the prestigious Special Weapons and Tactics (SWAT) Team. As Third Relief officers were walking down the steps from the second-floor roll call room on September 8, 1982, at 11:17 p.m., Police Communications dispatched Officer Weber (Call No. 302) to a report of Criminal Damaging at the Whippy Dip at 2790 River Road. The suspect was reported to be the operator of a 1968 Chevrolet Malibu parked across the street at 2787 River Road. Officer Klug (Call No. 302X), noting the proximity of the complainant to the suspect, advised that he would also respond. Upon arrival, the officers spoke to the complainant at the Whippy Dip. They then both walked across the street. Noting that the Malibu had a temporary license plate, Officer Weber opened the driver’s door to write down the vehicle identification number. Officer Klug held a flash light on the ID tag. That’s the last conscious thought Officer Klug would have for many months; and Officer Weber forever. Stephen Curry James, of 344 Resor Avenue, a Sanitary Engineer for the United States Public Health Service at the United States Environmental Protection Agency, was highly intoxicated and driving his 1972 Chevrolet Corvette inbound on River Road at twice the speed limit; weaving in and out of spaces between other cars, and almost rear-ending a car in the 2900 block of River Road. Just as Officer Weber closed the door on the Malibu, about 11:35 p.m., James slammed his Corvette into the officers and the Malibu. The Corvette carried Officer Weber about 40 feet before running into a utility pole. Officer Weber was probably killed instantly at the initial impact site from an amputated leg, blunt impacts to his head and extremities, skull fracture, and lacerations of the brain. Officer Klug was knocked over the Malibu and landed on the sidewalk with fractures and injuries from his skull to his ankles. His legs were nearly amputated at the knees. A citizen, William Kelly, observed the accident, tuned to Channel 9 (emergency channel) on his Citizen’s Band radio, and called for assistance. He then helped James out of the now-burning Corvette and comforted Officer Klug as best he could until help arrived. Stephen James tried to leave the scene when another citizen, Randal B. Atkins, using Officer Weber’s handcuffs, secured him to a steel fence until officers arrived. He also secured the officers’ firearms and took alcohol from the Corvette to preserve it as evidence. Police Officer Dean Ward (Call No. 316) transported Officer Weber to University Hospital, where he was pronounced dead at 12:30 a.m., and then to the Hamilton County Morgue. Captain Donald Byrd, District Three Commander, and Sergeant George Bredestege, the only supervisor working in District 3 that night, went to Officer Weber’s home to notify his wife, Judy. Responding EMS personnel and fellow officers had little hope that Officer Klug would survive. A Cincinnati Fire Paramedic Unit transported him to University Hospital. Police Officer Stephen R. Kramer (Call No. 307) responded to Officer Klug’s home to notify his wife, Vickie, and take her to University Hospital to be with her husband. Officer Klug hovered near death for weeks. Officer Weber was survived by his parents; wife, Judy (Clevenger) Weber; and children, Tara Weber and Eric Weber. FOP Services were held at 10:45 a.m. on September 11, 1982 at St. Aloysius Gonzaga Church in Bridgetown. A Mass of Christian Burial was celebrated at 11 a.m. He was buried on September 11, 1982 in St. Joseph’s (New) Cemetery. Stephen James was charged with and convicted of Aggravated Vehicular Homicide. Judge William S. Mathews sentenced him to the maximum of 1 to 5 years. After 36 days in prison, James’ attorney, Jack Rubenstein, filed for Shock Probation stating, incredibly, that James might lose his job if he was in prison any longer. On March 17, 1983, six months after killing Officer Weber and crippling Officer Klug, James was ordered released to a minimum-security overnight facility in Cincinnati (similar to a hotel) where he would be released to work his job daily at the EPA. However, there were no beds in the hotel, so Judge Mathews released him, on his own recognizance, until there was an opening. After meeting with the Weber and Klug families a week later on March 23, Judge Mathews reaffirmed his decision and James was still a free man. It is not known when, or if, room was ever made for James to be “incarcerated” overnight, but it is certain that within months, he was released outright on 3 years’ probation having served less than 2 months for killing a police officer and crippling another. It appears that James’s insurance paid out nominally to the Weber family and Officer Klug and none of the restitution came from Stephen Curry James – still to this day. By 2013 he was an adjunct professor of physics and management at Xavier University and retired from the United States Public Health Service. Twice divorced, he married famed contemporary arts curator Suzanne Markette Weaver, currently of the San Antonio Museum of Art. During 1995, Cincinnati Police Captain Christopher M. Robertson, Training Section Commander, and Lieutenant Stephen R. Kramer, Assistant Planning Section Commander, noting a 1950 Cincinnati ordinance calling for the retirement of badges of officers who died in the line of duty, petitioned Police Chief Michael C. Snowden to retire Badge 479; which he did. Also, they requisitioned plaques for all Cincinnati officers who died in the line of duty since 1950 and erected a memorial at the Cincinnati Police Academy. Officer Klug survived, but his injuries were such that he was medically retired as a Police Officer. He went back to work as a Police Technician and earned a stellar reputation as a Desk Man in District 3 until leaving 2005. He has endured dozens of surgeries since the accident. Dirt and infection in his body has remained during the intervening decades – sometimes dormant and sometimes flaring up. 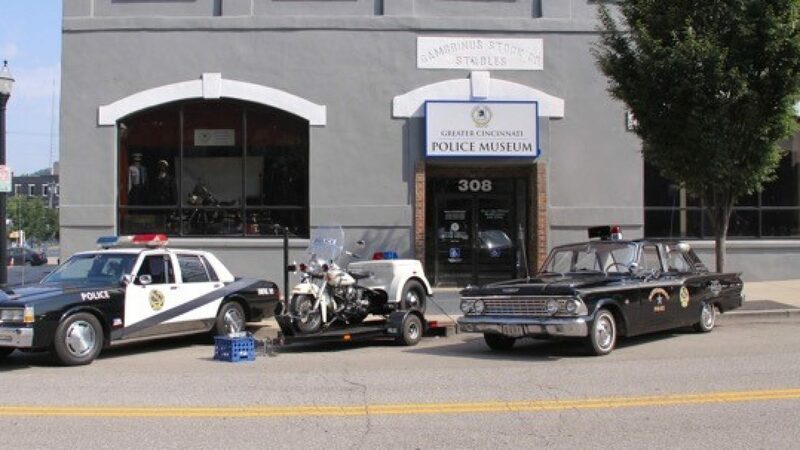 When the Greater Cincinnati Police Museum reopened in 2015 at 308 Reading Road, he began volunteering there and soon took over the Gift Shop. On July 13, 2015 Officer Klug had “minor” surgery on his left hand. His infections flared and by July 17, 2015 he was in the critical care unit at University Hospital with three types of infections coursing through his body, especially at his artificial joints and the hand. He endured two more surgeries, another one on his hand and one on his knee, to debride the infected tissue. He came away from these three surgeries with aspirational pneumonitis causing diminished lung function. He was sent home to recuperate for six months on intravenous antibiotics and oxygen. After two months the antibiotics were no longer overcoming the infection in his knee. On September 15, 2015 doctors cut yet again into his leg to remove and replace the artificial knee parts. Currently, doctors anticipate the necessity of a multilevel spinal fusion to keep him out of a wheelchair the rest of his life. Officer Klug returned to the Police Museum to run the Gift Shop. He can be found there most Tuesdays and Saturdays. On May 5, 2017, Officer Klug was awarded the first ever “President’s Award” at the 50th Annual Hamilton County Law Enforcement Awards. If you know of any information, artifacts, archives, or images regarding these officers or incident, please contact the Greater Cincinnati Police Museum at Memorial@Police-Museum.org. © This narrative was revised September 8, 2018 by Cincinnati Police Lieutenant Stephen R. Kramer (Retired), Greater Cincinnati Police Museum Memorial Committee Chairman. All rights are reserved to him and the Greater Cincinnati Police Historical Society.